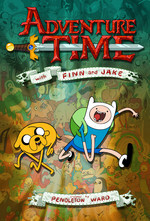 Finn and Jake search for the remains of Glob. Betty searches for the source of magic. Tiny Manticore searches for his courage. Magic Man gives up his search for his lost love. The true irony here is that Betty just cured Magic Man in exactly the manner she was hoping to cure Simon, but likely never will. Oh Betty, you never go full Magic Man. Finally, they got David Lynch to storyboard an episode. Jesse Moynihan: Some random post episode notes. Key quote from that link: "It’s interesting to me how Adventure Time’s character arcs happen on their own time, rather than in a direct, continuous line. I think this is because all the pieces are falling all over the place, and you have to wait and see how they land. Then you gage where your ideas maybe fit in that landscape. It can take a long time to get an idea through at the moment where it’ll work harmoniously with everything else that’s going on. The philosophy of Adventure Time I feel, is that life is moving along without a “story”. Life is just life. The story part is the pieces that viewers put together."